NCAA hockey semifinal: St. Norbert 4, Colby 3, final. Wow, the Mules had some terrific chances in the final minute and showed great heart in battling to the end with the top-ranked team in the country. What a memorable season this has been for our players, coaches, and fans. ...But Froese’s unassisted goal gave the Green Knights some valuable breathing room and proved to be the game-winner. Justin Grillo pulled the Mules within one with 5:52 left in regulation with his eighth off a Michael Rudolf assist but the Mules couldn’t get the equalizer for head coach Blaise MacDonald, who was named the recipient of the Eddie Jeremiah Award for the best Division III coach in the country on Thursday night. T.J. Black finished with 39 saves for St. Norbert’s while Sean Lawrence made 44 for Colby, which had allowed only six goals in five playoff games entering Friday’s game. Credit to the Mules, they found a way to get themselves back into contention — even when it appeared bleak at best and well out of reach at worst. A wild final five minutes of the period took both teams on a roller coaster ride to the intermission. First, J.P. Schuhlen put Colby on the board at 15:04 after cashing in one of St. Norbert goalie T.J. Black’s very few rebounds of the night. Less than a minute later, Lawrence made a dazzling post-to-post stop on Timmy Nicksic, and the Mules responded by getting Cam MacDonald’s pinpoint wrister on the power play to make it 3-2 with under three minutes left in the period. It was MacDonald’s team-leading 16th goal of the season. Colby's Dan Dupont and Spencer Hewson, as well as coach Blaise MacDonald, discuss the team just hours before hitting the ice for the national semifinals. Several longtime supporters say they've embraced the program's revival. Colby & UNE finish in top 10! WATERVILLE, Maine -- The Colby College men's hockey team finished the 2017-18 season as the sixth-ranked team in the United States College Online Division III Poll. HOOKSETT, N.H. — James Zanca, a 6-foot 1-inch, 190-pound defenseman for the New Hampshire Avalanche, has committed to the University of New England for the fall. Zanca, a Camden native, has completed his second season in the Eastern Hockey League, or EHL, and first with the Avalanche. Through the 30 games, Zanca tallied 41 points, which ranked second in the league in defensive scoring. WEST CHESTER, Pa. – The Northeast Collegiate Hockey Association (NECHA) announced its ACHA D3 All-Star Tournament nominations and four Terriers have been nominated. 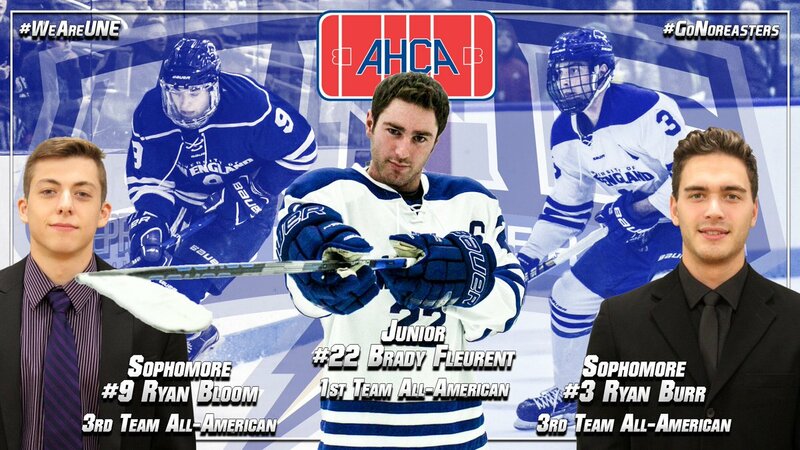 Senior Colby Blondin, sophomore Tom Green, freshman Ryley Austin, and freshman Zach Gagne were chosen to compete at the American Collegiate Hockey Association Division III All-Star Tournament to be held April 13 through April 15 in West Chester, Pennsylvania. Due to scheduling conflicts, Austin and Green will be the two players traveling to compete against nine ACHA conferences from around the country in a round-robin tournament. Team NECHA will be coached by Springfield College's George Johnson and Thomas College assistant coach Joe Waraskevich.